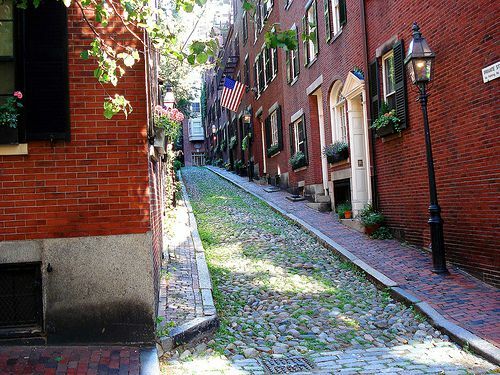 The majority of residential alleys have low traffic and infrequent repaving cycles, resulting in back roads with potholes and puddling that are uninviting or unattractive. 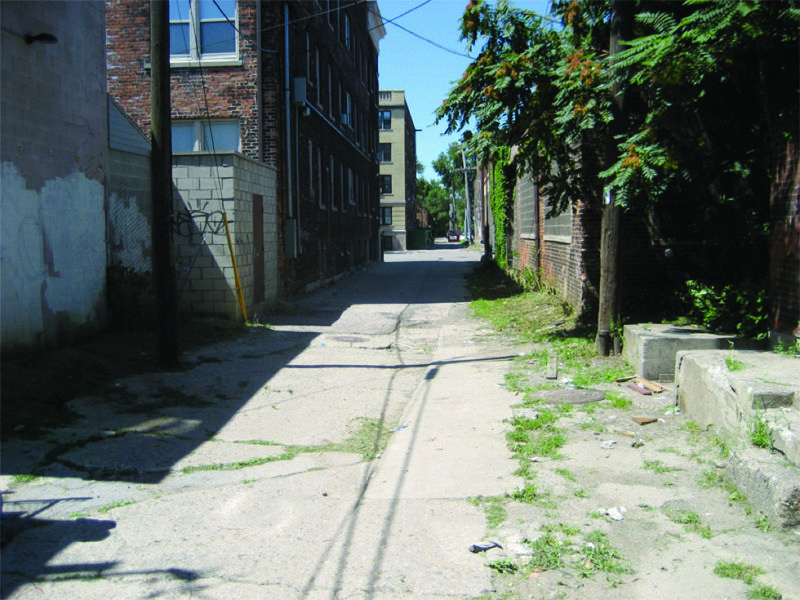 The alley shown below depicts a 14-foot path within a 28-foot right-of-way. 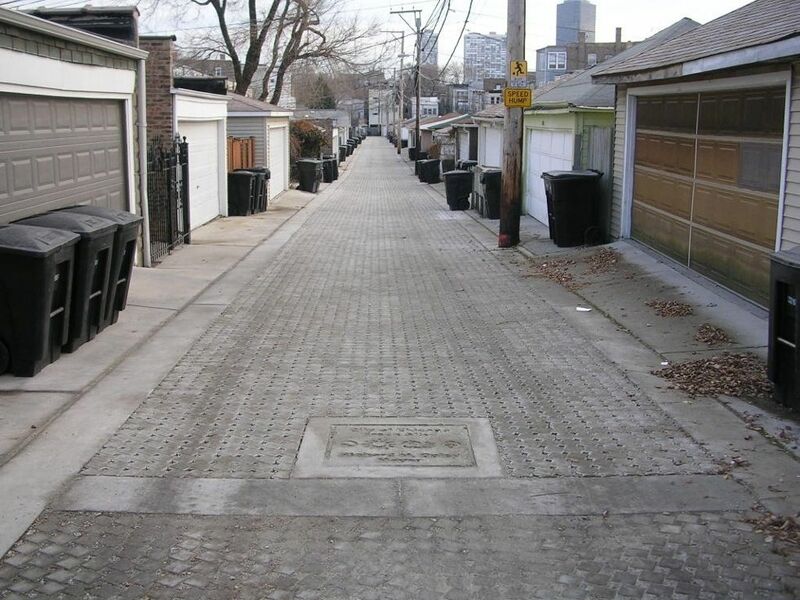 Public safety is of paramount consideration for all new and existing alleys. Good lighting is an essential prerequisite to a feeling of public safety in alleys. 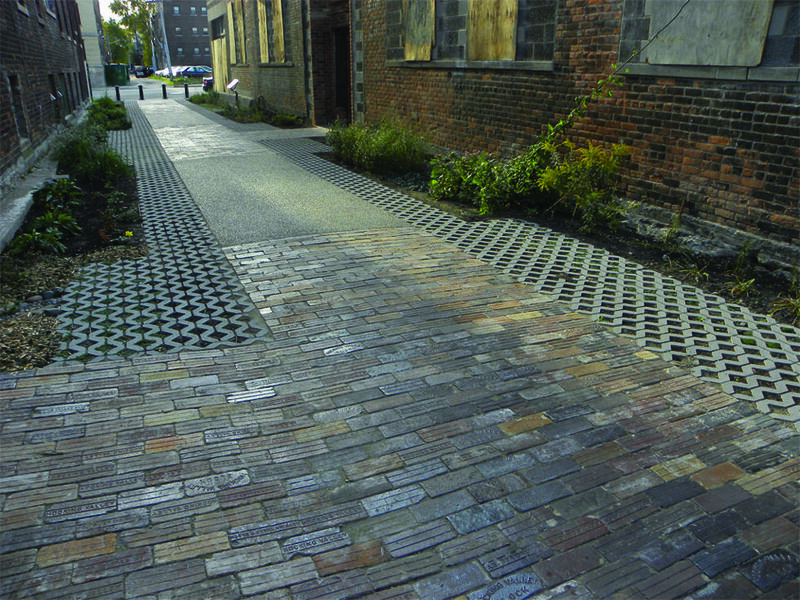 1 Construct green alleys with low-impact pavement materials, such as pervious pavements with high reflectivity to reduce heat island effects. 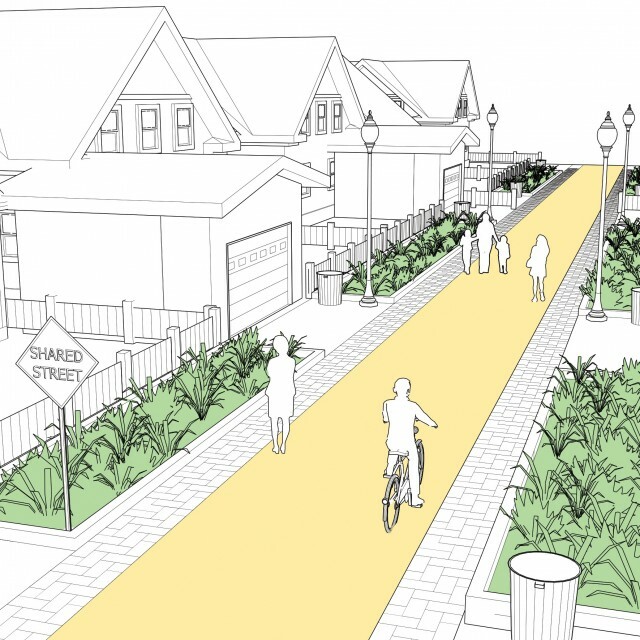 2 Alleys may be operated as pedestrian-only environments or as shared streets. Use bollards, signs, and design features that make clear the intended alley users. Where operated as shared streets, design features should indicate the desired path of travel for motorists, as well as any designated parking areas. 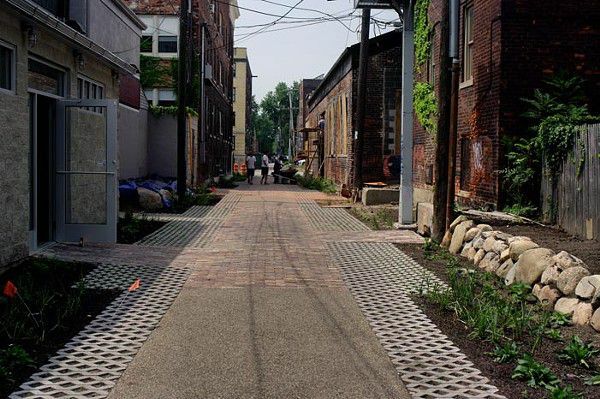 The City of Baltimore’s Alley Gating and Greening Program enables neighbors adjacent to an alleyway to decide if they would like to partially or fully close the alleyway for greening projects. “Alley Gating & Greening Program,” City of Baltimore, accessed May 31, 2013, http://www.baltimorecity.gov/Government/AgenciesDepartments/GeneralServices/AlleyGatingGreeningProgram.aspx. 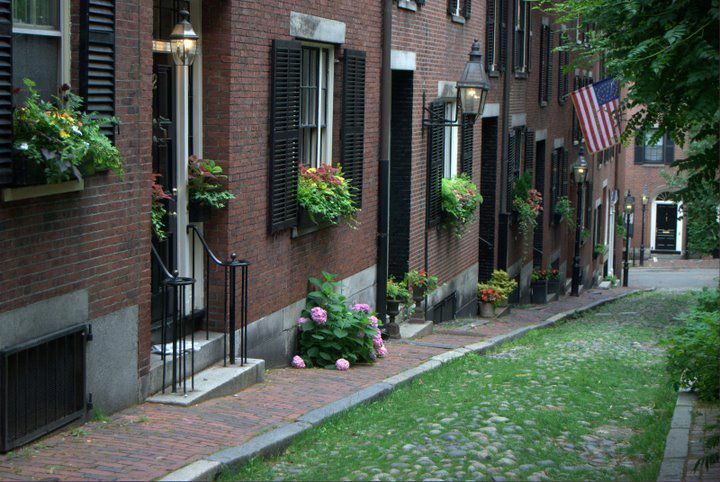 4 To maintain a safe environment, green alleys should have adequate lighting. 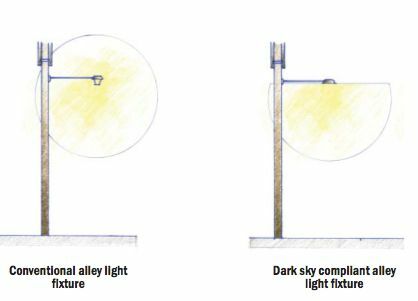 Pedestrian-scale light fixtures that focus their illumination toward the ground and minimize light pollution are recommended. 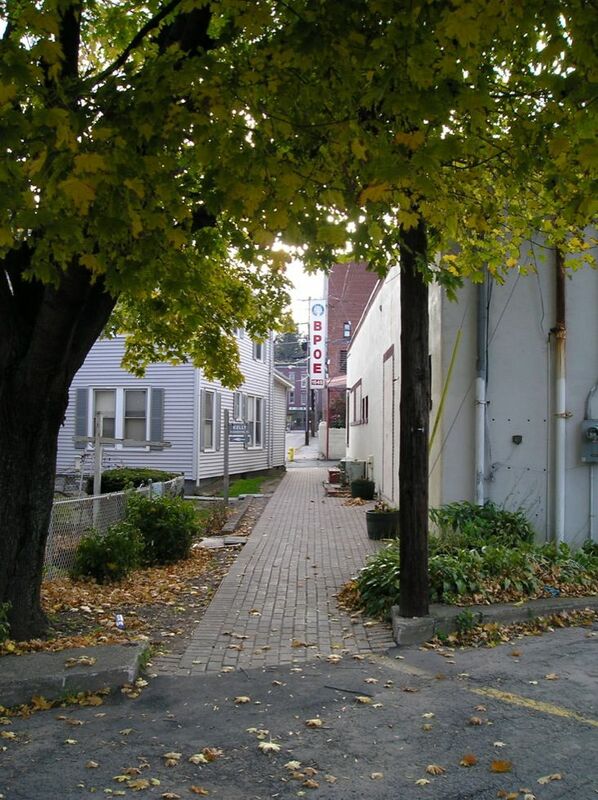 Public safety is of paramount consideration for all new and existing alleys. Good lighting is an essential prerequisite to a feeling of public safety in alleys. 5 Green alleys often run parallel to the larger street network, making them ideal low-speed, low-volume links for cyclists. While alleys can serve as low-speed connections for bicyclists, careful attention must be paid to visibility at all intersection crossings. Enhanced intersection crossing treatments should be considered where bicyclists may have limited visibility. 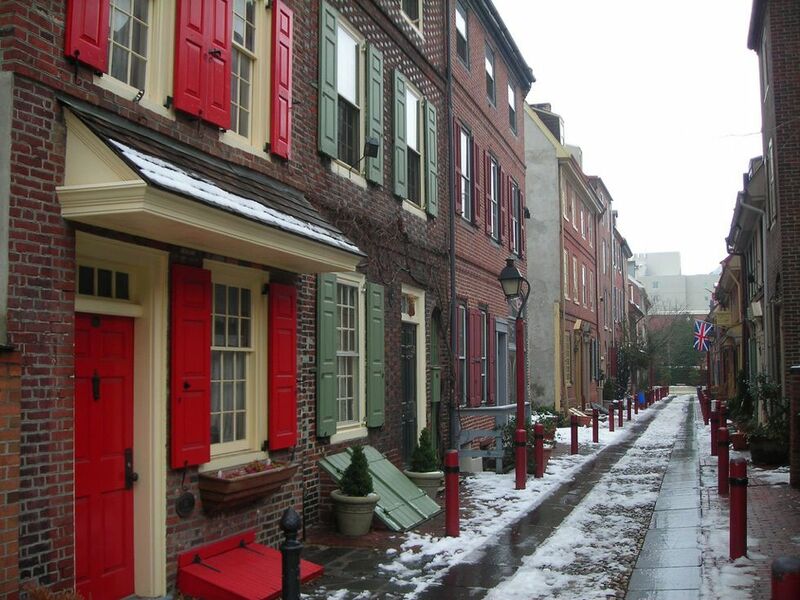 Green alleys may present certain unconventional maintenance responsibilities. Use of textured pavements and other materials may be challenging to existing street sweepers and snowplows. Similar to shared streets, alleys may benefit from the application of snowplow compatible materials and provisions for maintenance equipment access. 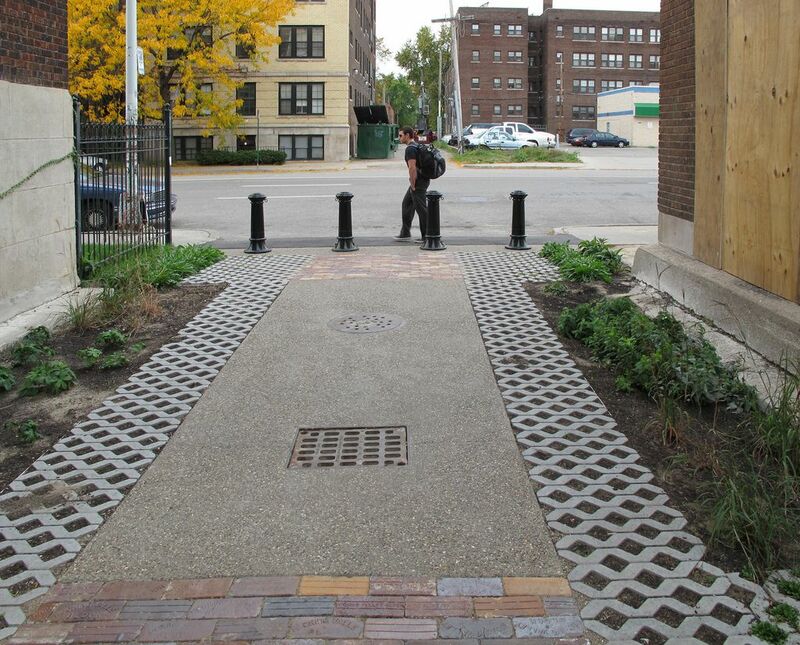 Chicago’s Green Alley Handbook provides guidance on alleyway design and suggestions for green alley adjacent properties. The Chicago Green Alley Handbook, (Chicago: Chicago Department of Transportation, 2010). Mary Fialko and Jennifer Hampton, Seattle Integrated Alley Handbook: Activating Alleys for a Lively City, (Seattle: University of Washington, 2011). 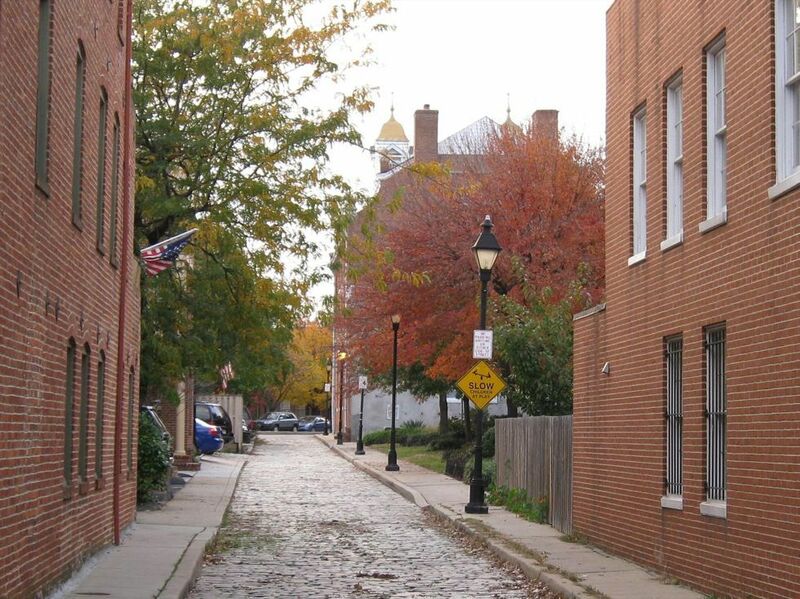 The City of Baltimore’s Alley Gating and Greening Program enables neighbors adjacent to an alleyway to decide if they would like to partially or fully close the alleyway for greening projects. “Alley Gating & Greening Program,” City of Baltimore, accessed May 31, 2013. The U.S. Environmental Protection Agency provides a wealth of literature related to green infrastructure, including bioswales, rain gardens, and other techniques for reducing the impact of large quantities of water during storms. For more information see the EPA’s website on Green Infrastructure. “What is Green Infrastructure?,” U.S. Environmental Protection Agency, accessed May 31, 2013, http://water.epa.gov/infrastructure/greeninfrastructure/index.cfm. The City of Seattle’s Street Edge Alternative Program’s primary objective is to restore natural drainage patterns to manage stormwater and prevent flooding. The program achieves these objectives through the reduction of impervious surfaces and increases in planting and other natural elements. “Street Edge Alternatives,” City of Seattle, accessed May 31, 2013. Street and Site Plan Design Standards, (Chicago: Department of Transportation, 2007), 23. Cassidy, Arly, Josh Newell, and Jennifer Wolch. Transforming Alleys into Green Infrastructure for Los Angeles. Los Angeles: Center for Sustainable Cities, University of Southern California, 2008. Chicago Department of Transportation. The Chicago Green Alley Handbook: An Action Guide to Create a Greener, Environmentally Sustainable Chicago. Chicago: 2010. Chicago Department of Transportation. Street and Site Plan Design Standards. Chicago: 2007. City of Baltimore. “Alley Gating & Greening Program.” Baltimore: 2013. City of Seattle. “Street Edge Alternative Program.” Accessed May 31, 2013. City of Los Angeles Sanitation Department of Public Works. 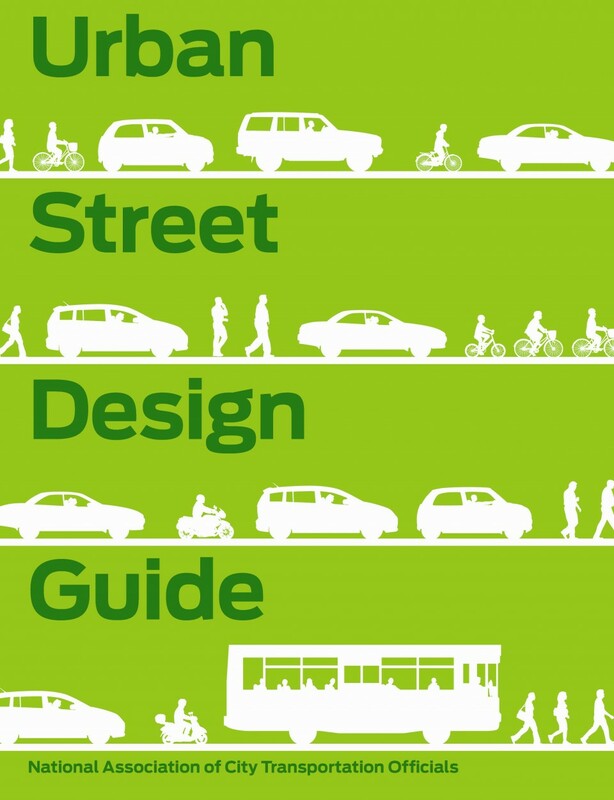 Green Streets and Green Alleys Design Guidelines Standards. Los Angeles: 2009. Environmental Protection Agency. Green Streets: Residential Streets, Commercial Streets, Arterial Streets, Alleys. 2009. Fialko, Mary, and Jennifer Hampton. “Seattle Integrated Alley Handbook: Activating Alleys for a Lively City.” Seattle: University of Washington, 2011. Nathanson, Benjamin and Danielle Emmet. Alley Gating & Greening Toolkit. Baltimore: Ashoka, 2008. Newell, Joshua P., Mona Seymour, Thomas Yee, Jennifer Renteria, Travis Longcore, Jennifer R. Wolch, and Anne Shishkovsky. 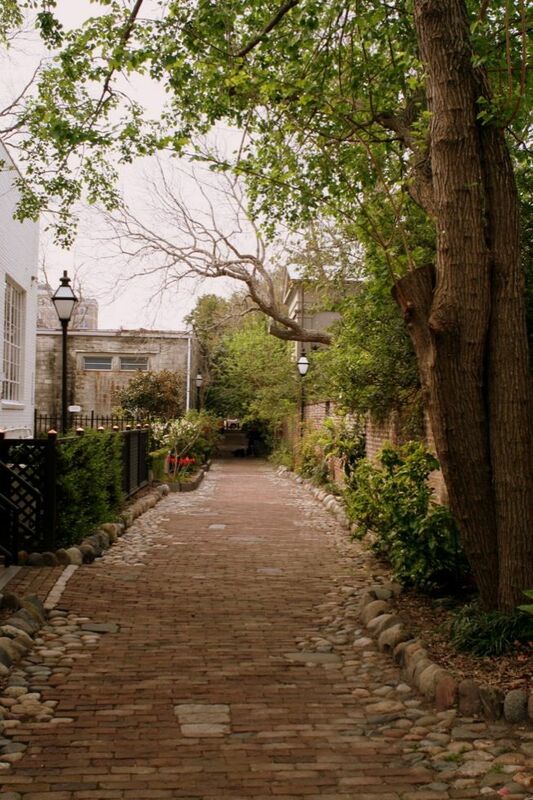 "Green Alley Programs: Planning for a Sustainable Urban Infrastructure?" Cities (2012): 1-12. U.S. Environmental Protection Agency. “What is Green Infrastructure?” Accessed May 31, 2013. References for Green Alley: 10 found. Nathanson, Benjamin & Danielle Emmet. "Alley Gating & Greening Toolkit." Community Greens, Ashoka, Baltimore, MD. City of Baltimore. "Alley Gating & Greening Program." General Services Department, City of Baltimore, Baltimore, MD. Chicago Department of Transportation. "The Chicago Green Alley Handbook: An Action Guide to Create a Greener, Environmentally Sustainable Chicago." Chicago Department of Transportation, Chicago Department of Transportation, Chicago, IL. US EPA. "Green Streets: Residential Streets, Commercial Streets, Arterial Streets, Alleys." Green Reserve, US Environmental Protection Agency, Washington, DC. Newell, Joshua P, Mona Seymour, Thomas Yee, Jennifer Renteria, Travis Longcore, Jennifer R. Wolch, & Anne Shishkovsky. 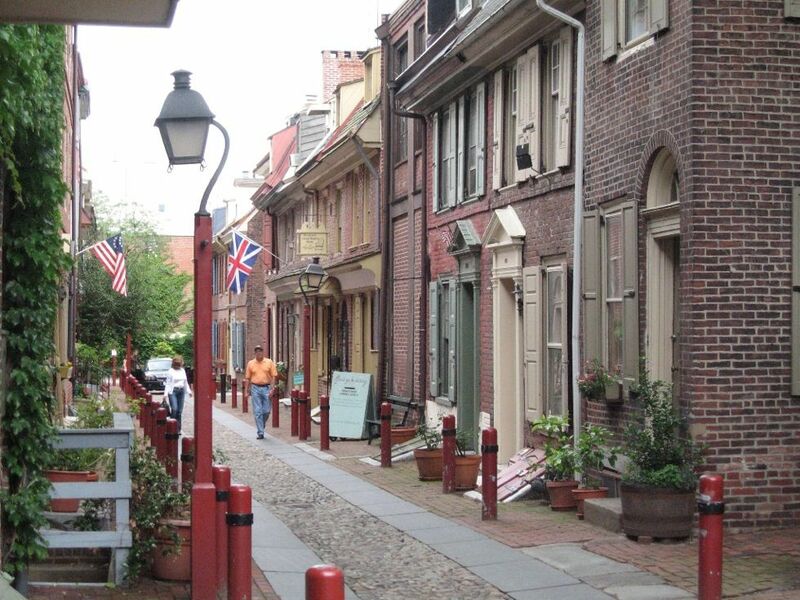 "Green Alley Programs: Planning for a Sustainable Urban Infrastructure?." Cities (2012): 1-12, Elsevier, New York, NY. City of Los Angeles Sanitation Department of Public Works. 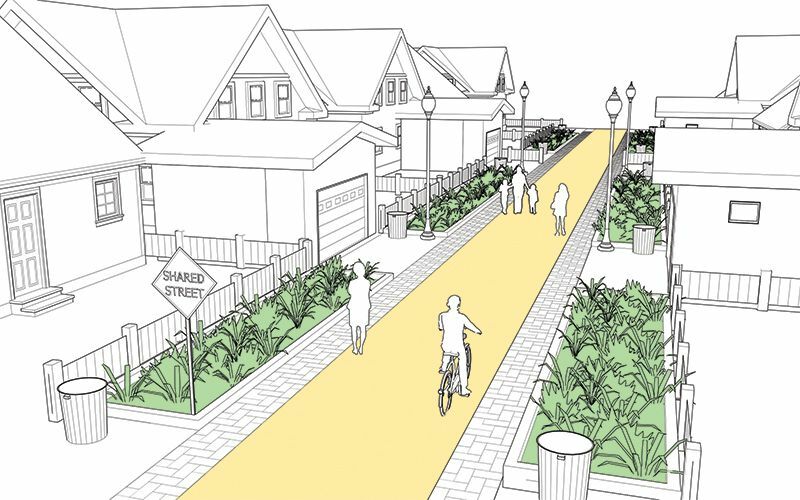 "Green Streets and Green Alleys Design Guidelines Standards." Department of Public Works, City of Los Angeles Sanitation, Los Angeles, CA. Fialko, Mary, & Jennifer Hampton. "Seattle Integrated Alley Handbook: Activating Alleys for a Lively City." UW Green Futures Lab, Scan Design Foundation, & Gehl Architects, University of Washington, Seattle, WA. Cassidy, Arly, Newell, Josh, & Wolch, Jennifer. "Transforming Alleys into Green Infrastructure for Los Angeles." Center for Sustainable Cities, University of Southern California, Los Angeles, CA. US EPA. "What is Green Infrastructure?." Office of Water, US Environmental Protection Agency, Washington, DC.